Join in the conversation about the impact of a positive mindset on a person’s chances in life and in college. Does a person’s belief in his or her ability to achieve influence success at achieving a life goal? This year’s common reader is Mindset written by the world renowned Stanford University psychologist, Carol S. Dwerk, Ph.D. 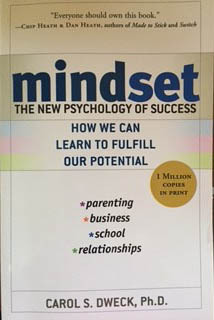 It is an easy read and the book takes a comprehensive look at the impact of a fixed mindset on success outcomes. Dr. Dweck shares that it is not just talent and intelligence that bring success but more often how each person approaches a goal which impacts achieving it. Don’t miss these powerful book discussions. There will be three discussions held on each campus. As in the past, we plan to publish the outcome of the discussions to this page. So that a person unable to engage in the dialogue can still participate. Guest Speaker at the End of the Discussion Series-We have not selected the speaker at this time but the tentative date is Friday, April 7, 2017.